Visa application can be made either in Vientiane, Laos or in Savannakhet, Laos. Although I haven’t applied in Savannakhet yet, people I know told me that you can get the passport back with the newly stamped visa on the same day if you apply there, as opposed to Vientiane which takes two days. However, that is not the case anymore. 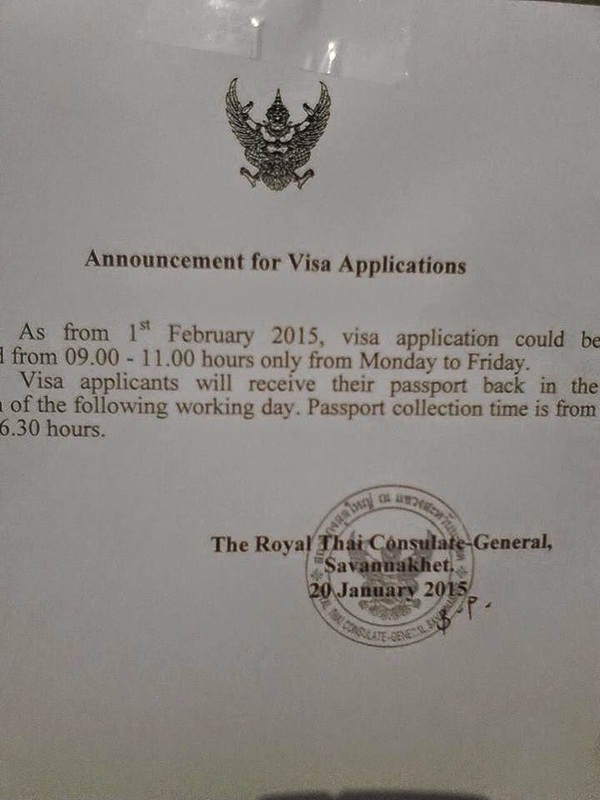 The Royal Thai Consulate-General in Savannakhet made an announcement for visa applications dated January 20, 2015. Starting on the 1st of February 2015 according to the announcement, visa applicants in Savannakhet will receive their passport back on the next day after applying. Pretty much like in Vientiane, right? Photo Credit: Ms. Amornrat Mattioli of www.thaivisaservice.com.